Seco Tools Australia presents the new X4 multi-edge system designed to meet the industry’s demand for grooving and parting-off tools with narrow cutting edges. Perfect for small-part manufacturers, the new Seco X4 multi-edge system features smaller shanks to accommodate an even broader range of machining applications such as Swiss parts. Strong, dependable system components in the X4 such as indexable tangential inserts with three-dimensional chipbreakers combined with a highly stable clamp design help achieve high accuracy, repeatability, productivity and surface quality in external grooving and parting-off operations involving small parts, slim bars and tubes made from a wide variety of common materials. The system’s MC chipbreaker inserts cover cutting-edge widths from 0.5mm to 3mm and cutting depths between 2.6mm and 6.5mm. Maximum bar diameter for cut off varies from 5.2mm to 13mm in diameter, depending on insert width. Insert profiles are available in neutral and angled right-handed and left-handed versions. Inserts in flat profiles, designated R and FG with positive rakes are also available. Featuring a round profile, the R-style inserts for grooving and profiling have cutting edges with 1mm to 3mm widths. The FG-style inserts cover groove widths from 1.15mm to 2.65mm and can machine lock-ring grooves to DIN471, DIN472, SMS1581 and SMS1582 standards. The Seco X4 multi-edge system uses CP500 in insert grades for increased wear resistance in challenging cutting scenarios and CP600 for a combination of toughness and wear resistance in general machining applications. An upper clamp rigidly holds the inserts, making it possible to fasten and release the clamping screw from the top or bottom. 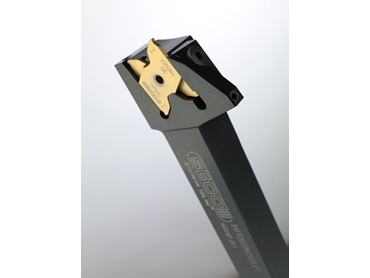 X4 toolholders come in a wide variety of shank sizes, including 1212, 1616, 2020 and 2525 as well as Seco-Capto C4, C5 and C6. The latest 1212 and 1616 shanks with a compact toolholder head design bring the reliability and value of the X4 system to small sliding head machines, where there is a need for small holders with cutting edges of narrow widths. A single toolholder works for all X4 insert types, allowing for a reduction in tooling inventory. All X4 toolholders, except for the toolholder head design for the 1212 shanks, incorporate Seco’s Jetstream Tooling Duo technology featuring coolant outlets from both the clamp and underneath the insert to further enhance productivity, lengthen tool life and improve chip control. The Jetstream Tooling Duo contributes to efficient cooling, ideal chip formation and high part quality.